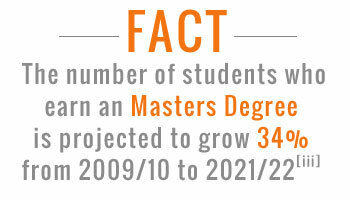 Online masters programs may be a recommended or required next step for moving forward in your career. In fact, according to the Bureau of Labor Statistics, the number of jobs that require a masters degree is projected to grow 18% between 2010 and 2020. [i]Today’s students’ options now include online masters degree programs that are often well-suited to busy working adults. A masters degree online, meaning all classes taken in an online setting, can typically take from one to three years to earn depending on the course of study, the candidate’s time commitment, and other factors. Candidates may choose to pursue a graduate degree directly after earning a Bachelor’s degree, or they may choose to gain some relevant work experience before enrolling in online masters programs. Professional degree programs, such as Masters in Business Administration (MBA) or a Masters in Education (M.Ed)., often prefer that candidates have some field experience prior to enrolling, while an MA (Master of Arts) or MS (Master of Science) may not have this requirement. Regardless of the degree you choose, you can typically expect to engage in a course-based or research-focused curriculum that builds on your existing foundations of knowledge. Earning your online masters degree may be a great way to enhance your qualifications as well as show expertise in your chosen field. Whether you’re looking to study at a private university, a non-profit institution or community college, there are a wide variety of programs offering masters degrees online. But choosing the best online masters programs for you can sometimes be tough. The good news is there are some major factors that can help you narrow things down, until you find the ideal option for you. It’s just a matter of doing some research! When choosing a college that offers online masters degrees, it’s important to ensure that it has been accredited. Accreditation lets you know that a school or program has been held to specific standards of quality, by an outside body. The type of accreditation that you should look for will really depend on your field and intended career path. For example, if you’re pursuing a MBA, you may want to look for a program that has been vetted by AACSB International – The Association to Advance Collegiate Schools of Business. Whereas, if you’re pursuing a masters degree in health informatics, you may want to choose a school that has been reviewed by the Commission on Accreditation for Health Informatics and Information Management Education. The point is, don’t risk your time and money by choosing a school without accreditation when you apply for online masters programs! Keep in mind that just because you’re planning to earn your master’s online, doesn’t mean you won’t need access to resources and services to help you along in your studies. The types of resources that will be important to you will vary depending on your situation. For example, if you think you’ll need some help with your studies, make sure you find out if online tutoring services are offered. Or if you’re pursuing a research-heavy degree, then access to online library resources should be a priority. Other things to consider are whether IT services are available and how easy it will be to access your professors. So do some digging—including talking to reps for your prospective schools—to find out more about what they have to offer. Remember, these stats shouldn’t be the be-all and end-all of making your decision, but they can give you an idea of whether or not students are completing programs and landing jobs once they graduate. Other things to keep in mind are transfer credit policies, tuition costs, and the type of financial aid offered by different schools. You may also want to investigate what the student-to-faculty ratio for your prospective program is, so you can guard against getting professors who are spread thin with obligations. Finally, if possible, take some time to speak to students in the online master’s degree programs that you’re considering so you can hear about the strengths and weaknesses firsthand. It will likely be worth the effort in the long-run! A masters degree is a college credential that students earn by completing 2 or 3 years of study, after having already completed a bachelor degree. A masters degree is sometimes known as a graduate degree, because only college graduates can enroll in these programs. Similarly, a college department that offers masters degrees may be referred to as graduate school, or grad school, for short. It's difficult to define "masters degrees" as a group, because their components are very different — depending on the subject being studied. But overall, masters degrees are set apart from bachelor degrees in that they are more focused and more advanced. Many masters degree programs involve a research component. Students spend months planning and writing a lengthy research paper that represents their findings. Some students build their research into a thesis — an academic paper that presents a new theory or a scholarly interpretation of an existing idea. These students might be asked to "defend" their work in front of a thesis committee. But many online masters programs do not require a formal thesis. Instead, students might need to pass a comprehensive final exam, or complete a capstone project. What's the difference between an "Academic" Masters Degree and a "Professional" Masters Degree? A masters degree can be used as a stepping stone from a bachelor degree to a Ph.D. In this case, the masters degree would be considered "academic," because its purpose is to allow for research, teaching, or further study. For example, if an education researcher wants to earn his Ph.D. in teaching and learning, he might complete an academic masters degree first. But some masters degrees are terminal — the end of the line, so to speak. Terminal masters degrees are the highest degrees possible or necessary in certain fields. Instead of further study, they prepare graduates for professional careers. Usually, terminal masters programs address real world job situations. Part of the course work is devoted to helping students practice or apply their growing knowledge. An MBA is a good example of a professional/terminal masters degree. Generally speaking, an MBA is the highest degree that most business professionals will need. Even though doctorate-level business programs do exist, these are usually intended for students who plan to teach business at the college level, or perform business research as consultants. Some fields offer both types: academic masters degrees and terminal/professional masters degrees. If you're not sure which type of masters degree you're looking for, it's a good idea to speak to some professionals in your desired field and speak to enrollment advisors from the programs you're considering. Most online masters programs degrees are professional masters degrees, simply because career-minded people are more drawn to the convenience and flexibility of the online format. However, there are some great online masters programs that are designed for college-level teachers and professional researchers. What Kind of Courses Are Involved in Online Masters Programs? Unlike most bachelor degrees, masters degrees usually don't involve general education requirements. By this point in your education, it's assumed that you can handle college-level math and basic writing. However, if your bachelor degree is not in the same field as your masters degree, you may be required to complete some prerequisites. Masters courses are divided between core requirements and electives. Your core requirements will probably cover 50 — 75% of all your graduate classes. The remaining 25% will be comprised of electives, which you can choose. The flexibility of your online masters program is an important point to consider when you're choosing a graduate school. Be sure to investigate how many electives you'll be allowed to take, and which departments you can choose from. How Long Will an Online Masters Degree Take? If you study on a fulltime basis, you can complete most masters degrees within 2 or 3 years. Some online programs are even shorter, because they offer classes year-round, as opposed to limiting their offerings during fall and spring semesters. If your online masters program involves a research paper or a thesis final (instead of an exam), you may need additional time to complete the work. Some graduate schools build this time into the masters curriculum, by requiring students to complete "thesis hours." Thesis hours are like an unofficial class. They are worth degree credits, but students are responsible for policing themselves and staying on task. Masters students who are completing thesis hours will check in with their thesis advisors, periodically, to report progress and ask questions. MicroMasters programs are a set of masters-level online courses that help you earn professional credentials and valuable university credits. Now you can test drive a MicroMasters Program for Free! Browse MicroMasters Programs now. What Are The Different Types Of Online Masters Programs? Depending on your career goals, there are a variety of different types of an online masters degree that may interest you. To get you started, let’s take a look at five of the more common types of academic and professional degrees. Masters of Arts degrees are basic graduate level degrees that can be earned in academic areas including English, history, geography, social sciences and more. An online MA may be course-based, research-based or a combination of both. Masters in Fine Arts is a creative degree that can be pursued in areas like visual arts, creative writing, graphic design or theater. Rather than write a thesis, students usually finish the online degree with a major piece of work or performance art. Like MAs, Masters of Science degrees are generally course-based, research-based or a combination. Examples of discipline areas for an online MS degrees include information systems, management, engineering and nursing. Masters of Business Administration degrees help prepare students with a mastery of the theory and application of business and management principles. Coursework generally involves areas like accounting, economics, finance and marketing. Masters of Education degrees are often pursued by educators who are looking to further advance in their field. Majors include areas like curriculum and instruction, counseling, school psychology and administration. Online Masters programs often culminate with a capstone course, thesis, or dissertation, in which students must demonstrate their understanding of key concepts and skills. Whether you are hoping to enter a new field, enhance your knowledge base in your existing field, or prepare to take your career to a new level, a Masters Degree program, such as a masters in counseling psych, might be your next step. An online masters degree may allow students to work towards their professional goals, explore exciting new subjects, and discover the rewards of graduate learning in a flexible environment. What Careers Could I Pursue With A Masters Degree?